We just got back from our first trip to Universal Orlando Resort. We enjoyed the restaurants at CityWalk, and “survived” three days at Islands of Adventure and Universal Studios, the two theme parks. Though, we didn’t go to Volcano Falls, Universal’s new waterpark. Maybe next trip. Since theme park tickets to Universal Orlando are pretty expensive, I knew I’d need to figure out ways to trim the vacation budget. To save you from having to do the same research, here’s a list of money saving tips that really work. Before traveling, I debated whether to purchase Universal Express passes. In October, the parks aren’t open as long (9:00 a.m. to 7:00 p.m. most days), so that means less time to do it all. Ultimately, we decided not to purchase Universal Express passes because of the cost. It worked out just fine! There aren’t a whole lot of rides at Universal Orlando, and with just a little planning, we never stood in long lines. If staying at one of the higher end resorts (not Cabana Bay Beach Resort or the soon-to-open Aventura), Universal Express passes are included. There’s no need to buy them. Some people don’t realize that and buy them unnecessarily! If going for multiple days and you really want to be sure you see it all, consider purchasing express passes for just one day. Think of it as ride insurance, but at a little lower rate! I rarely find that dining plans are a good value. Universal Orlando’s dining plans fit that same analysis. The quick service dining plan only saves you money IF you purchase the most expensive meal on the menu AND you like to drink soda. We are not big soda drinkers (pop for my midwestern friends) and we never ate the most expensive item on the menu. At Bumblebee Man’s Taco Truck at Universal Studios, we all got tacos for about $8.00/plate (two tacos and chips). Grand total for a family of four: $32 + tax. We drank water for free (you pay for bottled water, so ask for cups if you don’t want to pay). At Thunder Falls Terrace at Universal’s Islands of Adventure, we found the best dining bargain of all — the Rotisserie Chicken Salad with jicama, orange slices and cranberries — for $10/salad. Seriously, the salad was huge — enough that Ellie and I could share! Grand total for a family of four: $30 + tax. We drank cups of water again. Most other quick service meals include burgers and fries and similar dishes for less than $15. It’s hard to spend enough on a meal to get your money’s worth. 3. Use the single rider line! Blog follower, Audrey Thomas, shared this tip on my Facebook page while we were there, and it’s a huge time saver! Most rides have a single rider line — and you can use it with your family! As you go through the single rider queue, you stay together. Once you reach the front of the line, you get sent to the ride as spots need filled. Every time we were within a ride or two of each other, and many times we ended up on the same ride filling out the rows. Our only significant wait was 30 minutes at Escape from Gringott’s, though the standby line was 120 minutes. 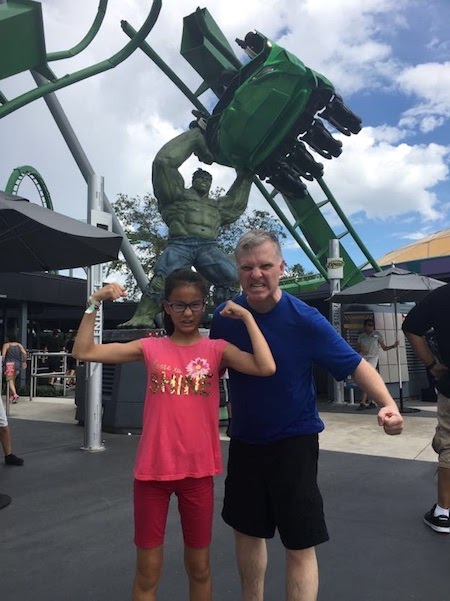 Setting a ride record, Ellie and Rob got through the Hulk ride in less than 10 minutes and rode at the same time! 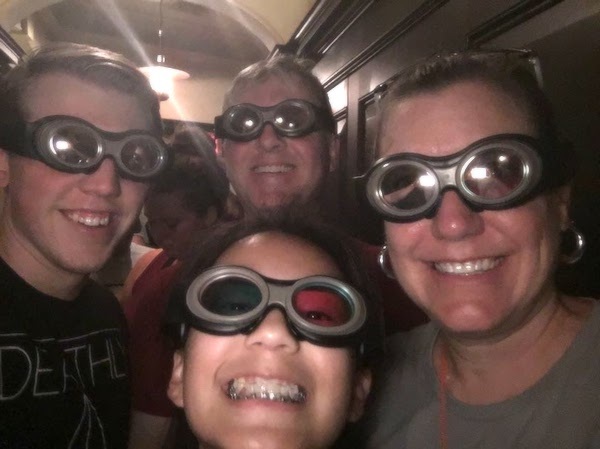 We rode Forbidden Journey (at the Hogwart’s castle) in less than 20 minutes start to finish. We recommend that the first time through, you go through the regular line to experience the ride together. Riding second and third time, though, single rider is great. Of course, as this secret gets out, those lines might grow! 4. Eat breakfast in your room. We flew this trip because of time, and packed instant oatmeal and high protein breakfast bars to eat as we got ready each morning. 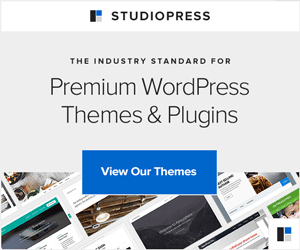 This saved us a considerable amount of time AND money — just a few dollars instead of $30-$40. We got to the parks for early entry by 7:15 each morning (they opened at 7:00 for guests staying onsite). Double savings! Great tip! 5. Carry snacks with you. We took a lightweight sling backpack to carry rain ponchos, sunglasses and snacks. Just like Disney, Universal Orlando allows snacks in the parks, just don’t bring rolling coolers, bottles or beverages. You can bring an empty water bottles to fill at drinking fountains or ask for cups of water at most dining locations. It’s free! And there you have it. 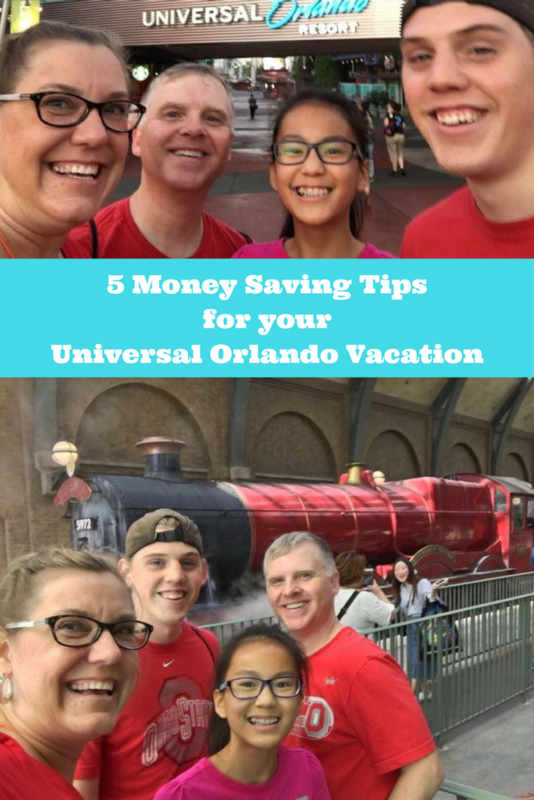 Five easy ways to save hundreds on your Universal Orlando Resort vacation. If you have a great money-saving tip, please share in the comments! I’ve never been to the other land..lol My ex husband and I took our daughter to WDW for her 8th birthday, ( that’s what she wanted to do) for 11 days..we went in May, so it wasn’t terribly hot. Actually it was pleasant, because we live in North East Texas. Talk about heat! I have wanted to go to that side, but have really felt that I would be disappointed, as I did Disney 1st..I’m also not 100% the trip would be frugal from Texas, cause my new Texas fella ain’t flyin’! lol These are really great tips though, I will definately keep them in mind if we decide to get over that way! Thank you. It took me 20 years to visit Universal (Disney aficionado here), so I understand. You’ve got lots of great theme parks in driving distance of you in Texas — so enjoy!